We lost our home to foreclosure two years ago. Are there any mortgage programs that can get us back into home ownership? Buying again after a foreclosure, short sale, or or deed-in-lieu of foreclosure can be done, with some hard work — and waiting. Lenders don’t like to see a foreclosure on your credit report. But, there may be some hope if you’ve demonstrated a rehabilitated life situation and have had perfect credit since the foreclosure. The lender is looking for proof that the circumstances that caused the foreclosure are well behind you and are not likely to be repeated. For example, if you had a medical emergency, incurred high hospital bills and missed work, but you are now recovered, then there’s a good chance you could be approved. But, if you had gambling problems and you’re still regularly visiting the casino, you won’t be approved. Connect with multiple lenders to determine if you meet the requirements for a new home loan. What is an extenuating circumstance? The loan underwriter will evaluate your situation and make a judgement call. Basically, he or she needs to build a case that your foreclosure was due to an event that had nothing to do with your lifestyle or choices, and despite your best efforts, you lost the home. There’s a seven-year waiting period after a foreclosure with a conventional conforming loan for both Fannie Mae or Freddie Mac backed loans. Both allow for a lesser waiting period with applicable, documented extenuating circumstances, though. In that case, there’s a minimum three-year waiting period and a 10% down payment requirement. Keep in mind that if you’re putting less than 20% down, you’ll be required to get private mortgage insurance (PMI). Check with your lender early in the process on how the PMI company views foreclosures. 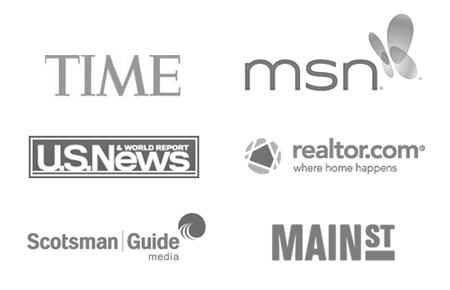 In many cases, PMI companies impose stricter standards than Fannie Mae or Freddie Mac. 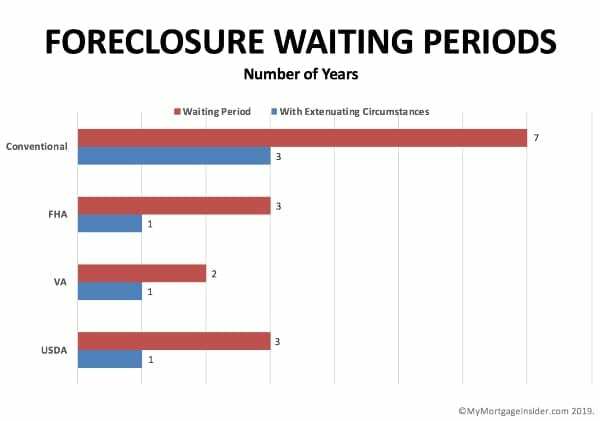 There’s a three-year waiting period after foreclosure for FHA loans. It does allow for documented extenuating circumstances, though it doesn’t specify an exact time frame. That said, you should expect for it to be at least one year — the guidelines require that “the borrower has re-established good credit since the foreclosure.” For bankruptcy, FHA requires no less than 12 months, and you can anticipate a similar minimum time frame for foreclosures. Potential extenuating circumstances are a “serious illness or death of a wage earner” but the “inability to sell the property due to a job transfer or relocation” does not. Divorce is also not considered an extenuating circumstance unless the property was awarded to your spouse who defaulted on the loan after you no longer owned it. The waiting period after foreclosure is two years for a VA loan with proof of re-established credit. Similar to FHA loans, extenuating circumstances are allowed for reasons “beyond the control” of the borrower if properly documented. The VA treats foreclosures similar to bankruptcies as well — at least one year of good credit before being eligible for a VA loan. If your foreclosed mortgage was a VA loan, you may not have any additional VA entitlement left. Entitlement will not be restored if your original VA loan was not repaid in full. You may also have a shorter waiting period if the new loan will significantly reduce your housing expenses, which will help improve your debt repayment ability. The USDA considers a significant reduction to be 50 percent or more. See if you’ll be approved for a home loan by connecting with multiple lenders. What is CAIVRS for government-backed loans? The Credit Alert Verification Reporting System (CAIVRS) is the federal government’s database to track individuals who have defaulted on federal financial obligations — like defaulting on a student loan or foreclosing on a home with a government-backed loan. You will not be able to access the CAIVRS list yourself, but your lender can and will check before approving your loan. If you’re applying for an FHA, VA, or USDA loan and you’re on the CAIVRS list, then you will not be approved for the loan. Delinquencies like student loan debt will stay on the CAIVRS list until it’s resolved in full, but if you’ve foreclosed on a government-backed loan, then you’ll have to wait three years before being removed from the list. Six government agencies report to CAIVRS — the Department of Housing and Urban Development, Department of Veterans Affairs, Department of Education, Department of Agriculture, Small Business Administration, and the Department of Justice. If you defaulted on debts to any of these departments, then more than likely you’ll be on the CAIVRS list. For some loan types, the waiting period after short sales and deed-in-lieu of foreclosures are different than a traditional foreclosure. Most offer shorter waiting periods with approved, documented extenuating circumstances. *The waiting periods provided are for deed-in-lieu foreclosures. The VA does not offer specific waiting periods for short sales. **Short sales on a principal residence to take advantage of declining market conditions are not eligible for a USDA mortgage loan. While the above waiting periods and restrictions are detailed in the specific loan guides, each lender can make additional rules and may require longer waiting periods. The good news is that it is possible to buy again after foreclosure, but it will take some time. Connect with multiple lenders to determine if you can be approved for another home loan. Next story What Is Private Mortgage Insurance?